If you have been following my blog for a while you might remember the orange! mini quilt I made a few weeks ago with my daughter. I am reposting this project to enter into Ellison Lane's Modern Mini Challenge. I love that my daughter has an interest in sewing so this was a fun project to do together (she's 5). I definitely did not have that interest when I was younger and I want sewing to be something that we can share. My daughter helped me arrange the fabrics and we pieced them before she went to bed. I quilted, bound, and hung it on the wall behind my computer while she was sleeping. It was so fun to see how excited and proud she was. Looks great Erica! I have fond memories of sewing with my mum as a child, so its lovely that your daughter is getting involved already. love the orange. My 5 year old is making a doll quilt now and it is so fun sharing my passion with her. :) Thanks for entering the Modern Mini Challenge! I love this! It's so inspiring to do one of my own! I used to help my mum the same way your daughter did; I remember having fun helping her out by moving all the blocks around. Love, love, love this, Erica!! I did quilts with my granddaughters one summer and I hope they love them (they went home with them and who knows what happens after that?). 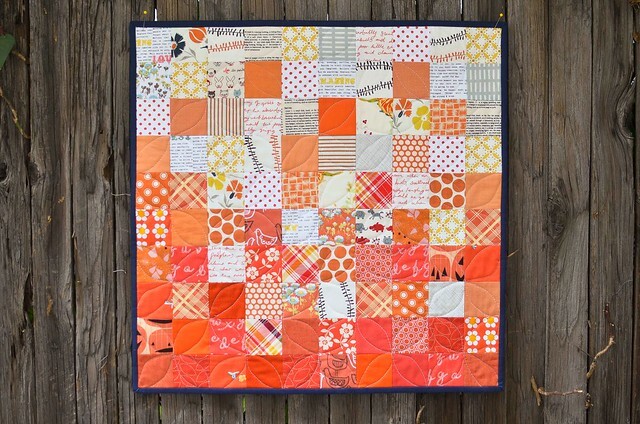 I love the orange squares--so fun and cheery. Fabuloso! Absolutely gorgeous Erica, I want to do exactly the same with my little one once she's a little older! A lovely, special mini to have made with your daughter! Great entry, Erica! You both did a great job! I love the orange. So fun that you could do this together! That is a beautiful quilt Erica and even more beautiful after reading about your daughter helping you with it. My daughters also love to sew and I too love that it is something we do together. How adorable! I am glad that you were able to enter as well. I should try that with my daughter. She is 5 as well and has started to express an interest in sewing. Plus she is always willing to help! Thanks for the great tip!